If a baby tooth is lost prematurely, your child may need a space maintainer to “save” the space. A baby tooth saves the spaces for the permanent tooth which will erupt into its position when the baby tooth is lost normally. 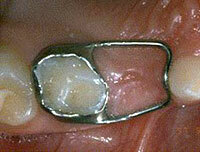 If a primary (baby) tooth is lost early due to decay, abscess, or trauma, a space maintainer is needed to save the space. If the space is not preserved, the other permanent teeth may drift causing crowding and orthodontic problems. Spacers are not permanent and are removed once the new tooth erupts or the abutment teeth get loose. Your child’s early years are extremely important to his or her’s future dental health and appearance. Don’t let tooth loss effect your child’s appearance and self confidence in later years. Start now!